If you’ve ever walked into your home, wrinkled your nose and thought, “What is that smell?” then you might be suffering from SHD: stale house disorder. Okay, so that’s not a real disorder, but it can happen to anyone. 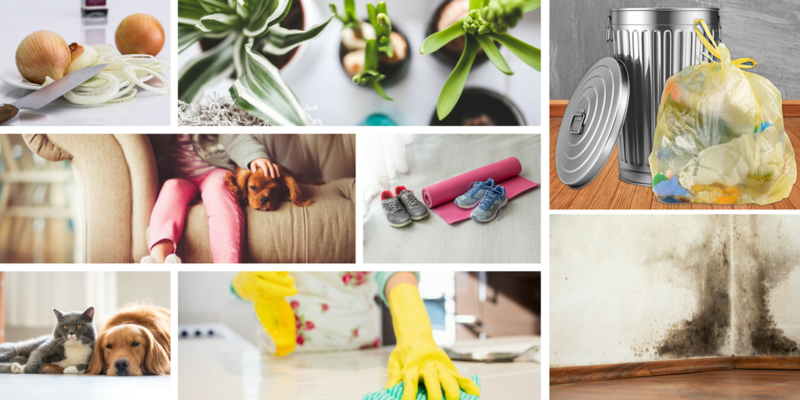 And bad odors – particularly stale ones – can be tricky to get rid of, especially if you’d rather not use chemical-laden solutions or blanket your home with artificial fragrances to cover up the smell. Since homes today are built to be much more efficient than homes from even 30 years ago, they’re efficient at a lot of things: retaining heat, retaining coolness, being well-insulated…and trapping every airborne contaminant and odor imaginable. Even airing out your home by opening a window can be less effective at getting rid of stale, unpleasant odors than you’d like. So what can cause stale air in a home? Let’s take a look. Leaks in duct work, roofing, or from appliances can cause water and moisture to collect, which then provides an ideal climate for mold and mildew to grow. In fact, if you can’t see the leak – which is common – your first clue might be the stale odor you’re suddenly smelling. Forgot to run the garbage disposal? Your nose will tell you. Infrequently cleaned trashcans can also cause a stale odor to permeate your entire home, as can accidentally burning food or cooking something that takes an agonizingly long time to dissipate. So your sweetheart brought you roses! If they’re still alive a week later, you got a good batch. And if the water they’ve been sitting in a week later doesn’t stink to high heaven, consider yourself lucky. Although plants can help improve indoor air quality conditions, they can have the opposite effect if they’re sitting in a pool of water. Smoke’s one of those insidious things that can creep into your home whether you like it or not. Neighbor burning leaves? Chances are, the inside of your home will absorb some of the smell. Tobacco smoke is one of the biggest culprits when it comes to stale indoor air. Fresh smoke smells much different from smoke that’s accumulated over time, and it can be very difficult to remove. If you have a mudroom, you know what we mean. Coats, boots, soccer cleats, and a baseball cap collection can all emit stale, sweaty odors (caused by bacteria found in sweat). And there is no smell quite as specific as wet dog. Fido loves nothing more than rolling in piles of who-knows-what out in the yard and then bringing it back into your home. With that comes unpleasant odors that stick around and refuse to die. Rugs and carpets really act as a big sponge: whatever’s spilled, tracked in, or transferred from feet or hands can end up on carpeting. Humans can shed a million skin cells an hour – and if you’re indoors, much of that will find its way to the carpet. Tobacco and smoke odors also get trapped in carpet, creating a stale odor, which can then permeate the entire home. So if your indoor air is stale because of one or more of these factors, what can you do? A few obvious things first. What can also help immensely is investing in a high-quality, premium-grade air purifier that you can run continuously in your home. We think the Lux Guardian Air Platinum by Aerus is smart pick for homes and businesses. It features Photocatalytic Oxidation (PCO), which uses the combination of UV light and titanium dioxide to control contaminants. The Guardian Air captures 99.97% of the tiniest particles as small as 0.1 microns, including pollen, smoke, dust mites, mold spores and pet dander, which can greatly reduce the odors in your home — all without chemicals, fragrances or ozone. No installation is required for the Lux Guardian Air, and it’s ENERGY STAR certified, which means it needs less energy to operate. I wonder, could be useful the humidifier for allergics in such cases?